By the time the Clearance Diving Branch had been formally established in 1952, clearance divers had burst upon the unsuspecting major fleets of the Royal Navy. 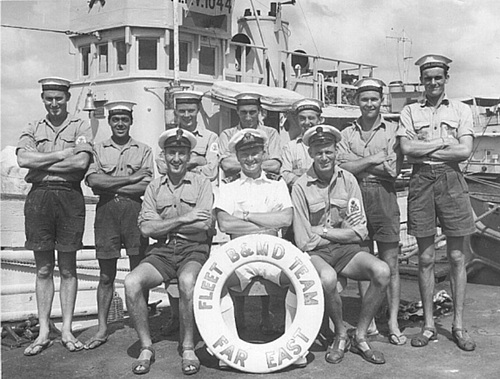 The Far East Fleet Clearance Diving team (FECDT) travelled by troop ship to Hong Kong in 1951, stopping at a number of the many naval bases along the way in those days including Gibraltar, Malta, Aden, Tricomalee and Singapore. Led by Lt Eric Gash RN and CPO Nick Carter, their immediate task was to train shallow water divers and then exercise the ships of the Fleet in their defence against attack by underwater swimmers. But it was not long before the team embarked on a tour of the station to undertake the disposal of various types of explosive ordnance left over from WWII, above and below the water. This was a task that would dominate the team’s activities for the whole of its twenty years of service in the Far East. South East Asia provided a happy hunting ground for all forms of ordnance. 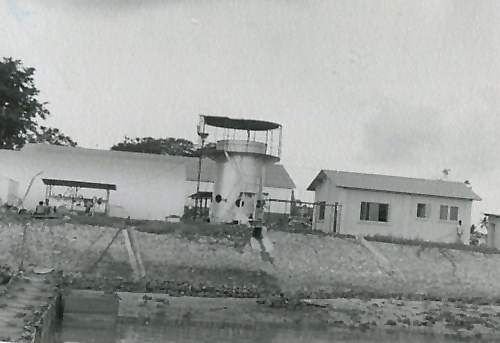 In 1953 the team disposed of some fifty tons of Japanese bombs lying under and around Ayer Samak jetty, Singapore. There were about 200 of them ranging from 50 to 250kg, mainly high explosive with some phosphorous and anti-personnel. Some were sunk in the mud with only their tails showing, many were fused together and all were covered in marine growth. So dangerous did they seem that it was decided to countermine the lot. The village was cleared during the morning and at 1230 there was a very large explosion that provided the whole community with a fish supper. 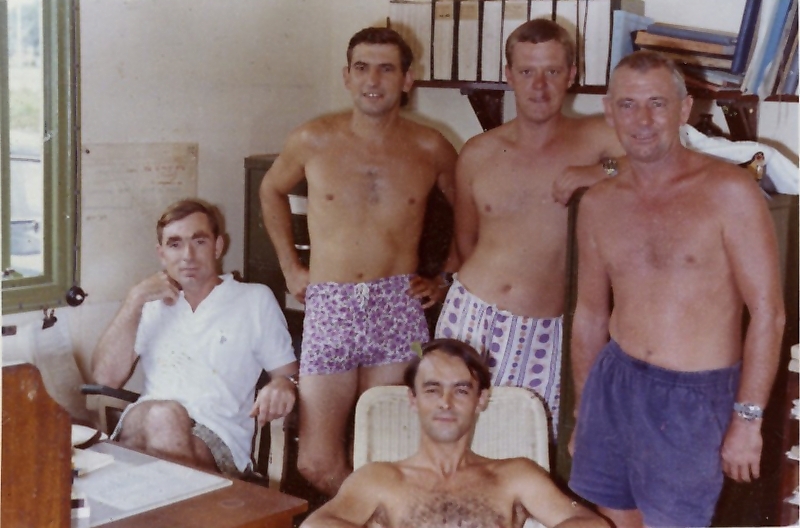 Personnel came and went; Harry Wardle took over from Eric Gash. The team continued their regular visits to Singapore and Malaya for the disposal of ordnance and general diving duties. It was during one of these visits that tragedy struck the team when LS(D) Charles Brian Larkin, aged 21, suffered a fatal shark attack on 28 July 1954 while diving in 20 feet of water off the commercial harbour in Singapore. He died shortly after being brought back into the diving boat and is buried in Kranji Military Cemetery. As recorded here on the Veterans UK website, his name is included on the Armed Forces Memorial and the Roll of Honour at the National Memorial Arboretum. After further visits to Penang and Port Swettenham, the team returned to Hong Kong to resume their training duties with the Fleet. The team continued its training task in Hong Kong and its regular tours elsewhere in the region until 1957 when its commitment to the disposal of ordnance in Singapore and Malaya was taken over by a new team led by Peter Messervy and Ted Butler. 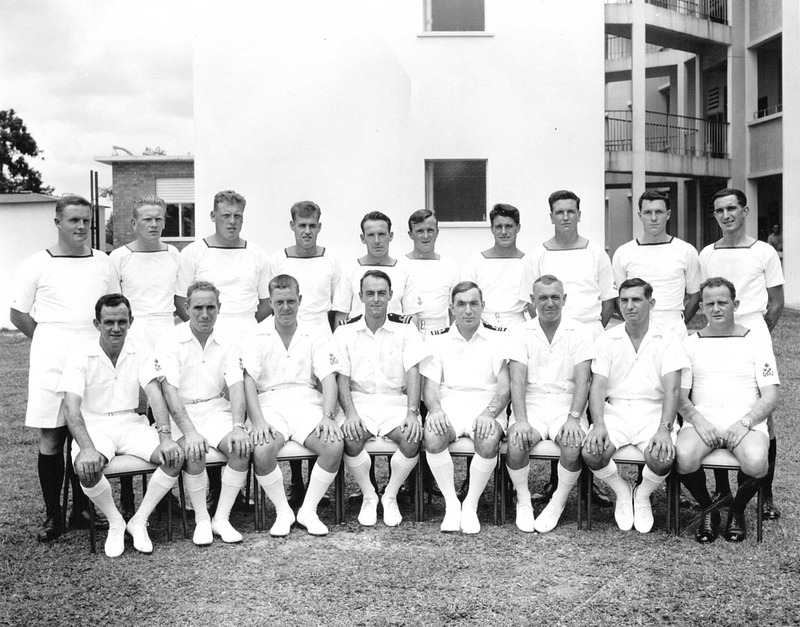 The team’s most interesting job was in June 1959 when they removed six live torpedoes from a sunken Japanese submarine off Keppel Island in the Johore Strait for which Peter Messervy was awarded the George Medal. He and the team worked for several weeks to extricate the torpedoes at a depth of 42 feet, often in nil visibility, sometimes using flame-cutters only a few feet away from the live warheads. 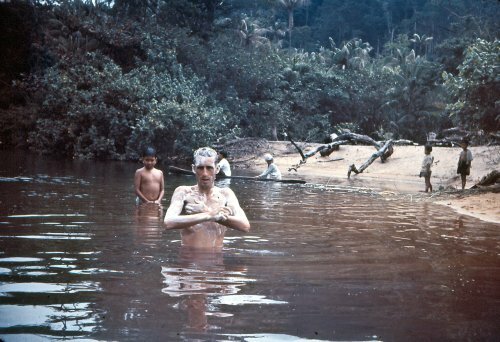 While working on the submarine, the team received an emergency request from the Army to recover a new and secret type of Belgian rifle, inadvertently dropped in a river in the Johore jungle. It was vital that the weapon did not fall into terrorists' hands and the team found it in a single dive. The B&MD team also became involved in a high profile salvage operation after the Singapore Harbour Tug Pitho capsized and sank in the western entrance to Keppel Harbour following a collision with a Japanese freighter. This effectively blocked the harbour entry to be used by the Royal Yacht Britannia some ten days later. The team carried out a survey that revealed the tug was relatively undamaged and the Navy was asked to raise it. 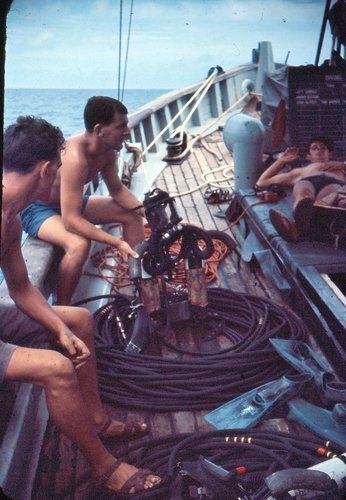 The team passed 7” wires under the tug and secured them to four flooded ‘camels’ secured between two bar vessels that assisted the hoist once the camels had been blown. Unfortunately, the 7” wires parted during the lift, the Pitho remained on the sea bed and the Royal Yacht was diverted. A few days later, the team returned to the task using heavier gear including 9” wire tailed with chain cable to secure two ‘camels’. The two bar vessels then succeeded in lifting Pitho which was then pumped out, refitted and returned to service. In 1959 it was decided that the Hong Kong team should be moved down to the Sembawang Naval Base in Singapore to join forces with the B&MD team and set up the Fleet Diving Centre in HMS Terror. Facilities were installed ashore for the team and the school was provided with the diving tank brought down from Hong Kong and an old battle practice target to act both as a diving platform for the trainee divers and a jetty for the various craft the teams had acquired. 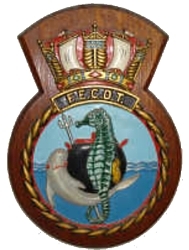 Before the FECDT finally departed Hong Kong for its new base at HMS Terror in the Naval Base at Singapore, FCDO Arthur Checksfield was dined out from HMS Tamar. It so happened that this coincided with the Governor of Hong Kong’s annual attendance at a mess dinner. Arthur was well known for his sense of humour and the members looked forward to his words of farewell. So it was with some slight disappointment that they heard his quiet words of thanks to the mess and politely applauded as he sat down. They did not see him light the blue touch paper that initiated the Chinese firecrackers secured under the table along its length that were so vigorous in their action that the table took off. The Governor was not amused and expressed the desire that Arthur, having left Hong Kong, should not return while the Governor was still in office. Perhaps this was why, during the (essential) Hong Kong part of his turnover to Mike Gillam a few months later, it took place largely downtown, outside the naval base. With both teams working as one in Singapore, they continued with fulfilling their main tasks of training and B&MD. 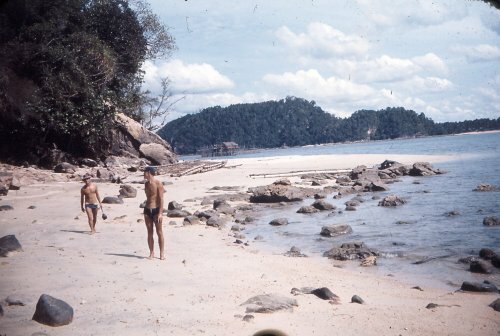 In 1961, the team joined the Inshore Flotilla on its clearance of those areas off North Borneo where the charts still indicated a danger from WWII mining operations. The team was based in HMS Woodbridge Haven (know affectionately as 'Woo-Ha'), its task to carry out a visual survey of those areas too close to the coral for conventional sweeping operations. This required long underwater swims from dawn to dusk from small open boats. Thus it became known to the team as ‘Operation SUNBURN’. 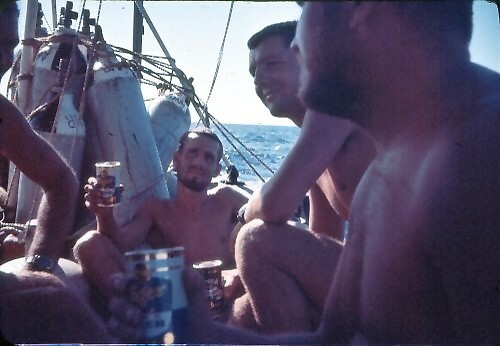 After a week of unremitting toil, the flotilla repaired to nearby Sandakan for couple of days R&R and, as expected, some team members slid ashore for a couple of beers or so. This provided them with an opportunity for earnest debate on matters thought to be of importance. As the evening progressed, the discussion of one particular couple became quietly physical. It was, perhaps, unfortunate that the Naval patrol, amateurs to a man, were passing by and mistook the friendly tussle for an old fashioned fracas. So the patrol walked the two chums back to the jetty for a formal resolution of their discussion. It was even more unfortunate that the First Lieutenant had decided that single brow was all that was needed. This provided an ideal platform from which the two chums made their stand. Standing back to back, they challenged the patrol to move them. This took place in the early evening, that busy time when the last of the guests to the official ‘first night in’ cocktail party were arriving and the first of the guests were just leaving. A message swiftly passed from the officer of the day to Captain IF, then to the Boss and finally to the Chief who dispensed his own unique form of physical debate and the problem was solved. Operation SUNBURN continued but no mines were found. One day the Boss was summoned to the Fleet HQ by CSO (Ops), FTASO being away. An emergency had arisen. One of the CMS (Coastal Mine Sweepers) had managed to damage both her screws on a coral reef off North Borneo and was unable to return to Singapore under her own power. Could the team save the situation with a double screw change underwater on site? The Boss was committed to a Fleet exercise and Boss 2 was away on a bomb job so it was suggested that the PO CD1 would undertake the task. 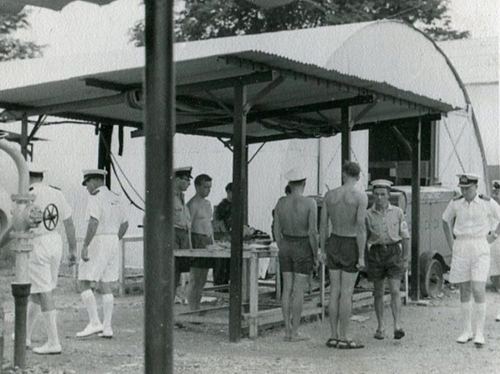 He would arrange with the RAF for a small team to be transported, together with its equipment and the two CMS screws, liaise with the local authorities, do the double screw change and return back to base, safe and sound. “On your head be it,” said the CSO. Being one of the old school, he added, “I have heard that you call your divers by their first names. What do they call you? The job went well as everyone who knew the team was sure it would. CSO (Ops) was Captain Leach (later Admiral of the Fleet Sir Henry Leach) and Tom King was the PO CD1. Early on in its time in the Far East, the team was provided with a fleet of small craft led by the elderly MFV 1044 (75 feet) and MFV 164 (50 feet) with a small engineering team to keep them running. 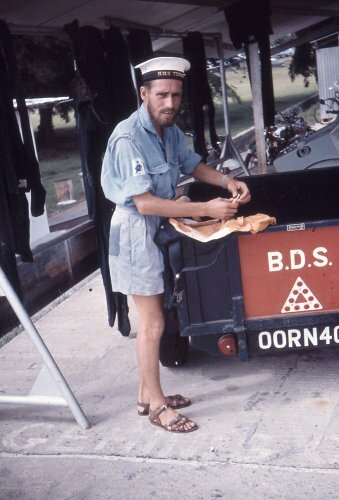 They provided transport, accommodation and a reasonable platform from which many diving and B&MD operations were carried out. The longest voyage that they were required to undertake was from the Singapore Naval Base up the East Coast to Pulau Tioman, the island where the fleet anchored during the local annual training exercise. 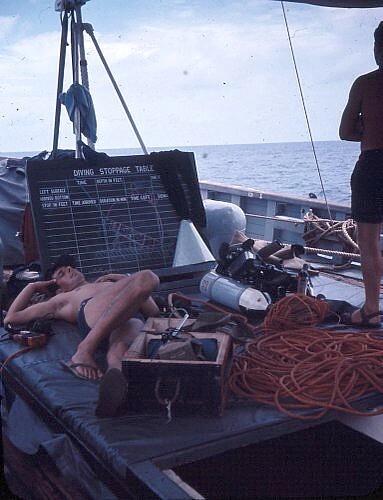 These trips always included an opportunity to exercise the ships’ response to underwater attack by divers and check the ability of ships' diving teams to search underwater. 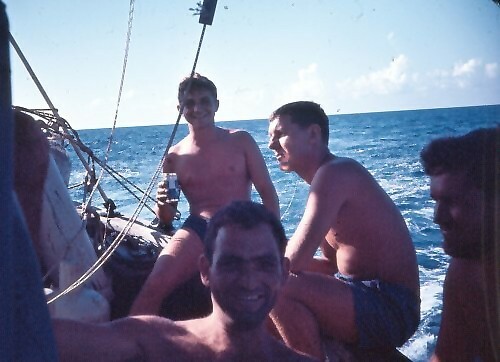 To while away the time when the fleet was away from the anchorage, the FECDT took the opportunity to explore the waters around the island and engage in some barter with the islanders - giant clams for coconuts. Despite the efforts of the engineering team, the elderly MFVs were not always reliable so one year it was decided that both should make the trip in case one or the other might have problems. In the event, all went well until the return journey when one MFV failed and the other took it in tow. Then as the pair made their way into the Johore Strait, the second one failed so both MFVs were towed home by a CMS from the Inshore Flotilla, returning to base. It took a long time to live that down! 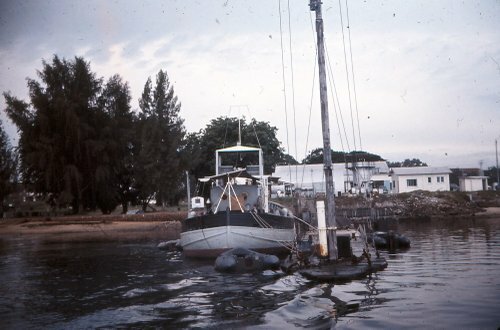 This episode concentrated minds on the need for a obtaining a more reliable vessel from which future diving operations might be conducted and it was suggested that one of the junks confiscated by the authorities in Hong Kong might be adapted by the dockyard for the purpose at little cost. This was formally proposed to MOD (Navy) for urgent consideration. Some months later, the team was informed that the junk’s stability curves were required to ensure that proper service standards could be met. It turned out that these were only obtainable from the men who had constructed the vessel, by hand, from skills developed over a thousand years – if they could be found – so the plan was abandoned in favour of a much better idea; to design and build a diving support tender from scratch. 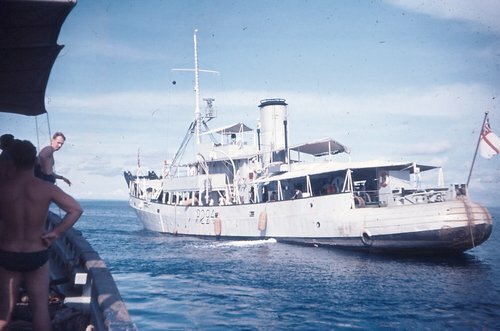 The diving tender Datchet was built in Singapore for the RN a few years later. 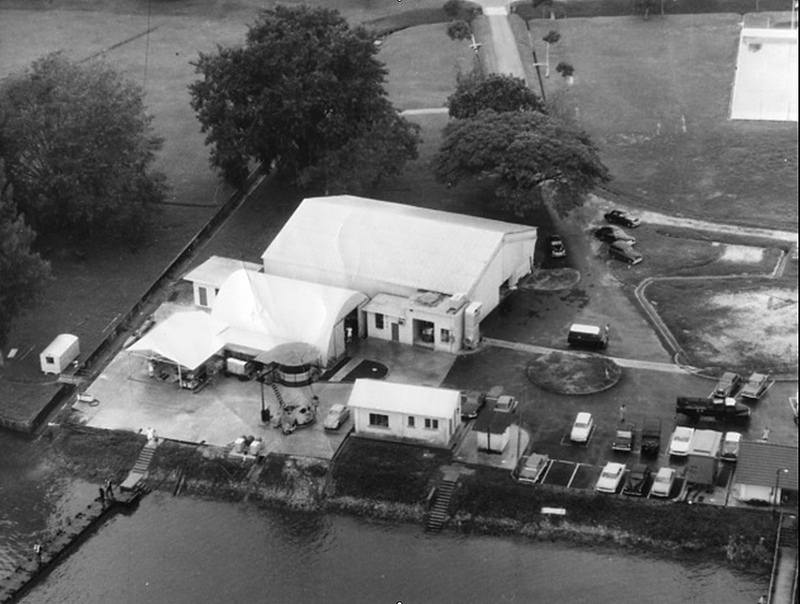 She had a steel hull and a comparatively fragile marine plywood superstructure. It was said that she led an interesting and improbably charmed life in all manner of places. She was a pig of a thing; so noisy at sea that no one slept. There was a buzz that quieter engines were to be fitted but it was just a buzz!! The RN could have done much better than her for a lot less. When I got to Hong Kong I had to report to some pompous Major who always wanted me to march into his office and salute him. I told him the Navy did not do things that way. We never got on that well. One day I was patrolling the streets near the Peak when a window opened and a voice said, "What is going on down there?" The sailor accompanying me then shot at him. Fortunately, he missed him and we heard no more but people were told to keep their windows shut! On another occasion, a bomb was placed in a hole in the wall. The Policeman who was with me said it was not a problem so I blew it up. On the other side of the wall was a very large electrical transformer, now riddled with shrapnel and leaking large amounts of fluid, down a steep incline. As I looked up at the skyscrapers around me, I could see all the lights slowly going out. Fortunately the MoD had immunity and I was never held to blame! We only ever stayed for two weeks to avoid getting bomb happy. The Army did longer and paid the price! One day, a bomb was placed on a very tall electrical pylon near the top of the Peak. I said they would need to get a helicopter because I was not going to climb it! The helicopter duly arrived and I did the business (with the current off!). What I did not realise at the time was half of Hong Kong was watching, including the Governor General and the Commodore. The publicity did me no harm. 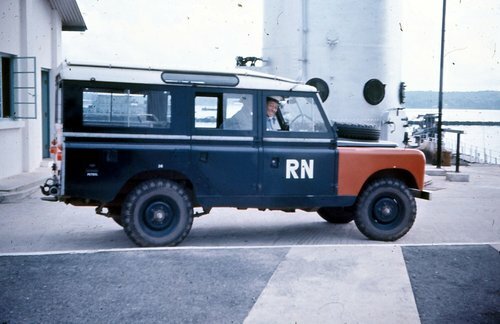 It was reported that the most frightening aspect of the task was travelling in a police Land Rover during the rush hour, siren blaring, at full speed, on the wrong side of the road, through red lights. Those were the days! John returned to the Far East as Fleet B&MD Officer and was appointed an MBE for his efforts that included the clearance of Japanese torpedoes. 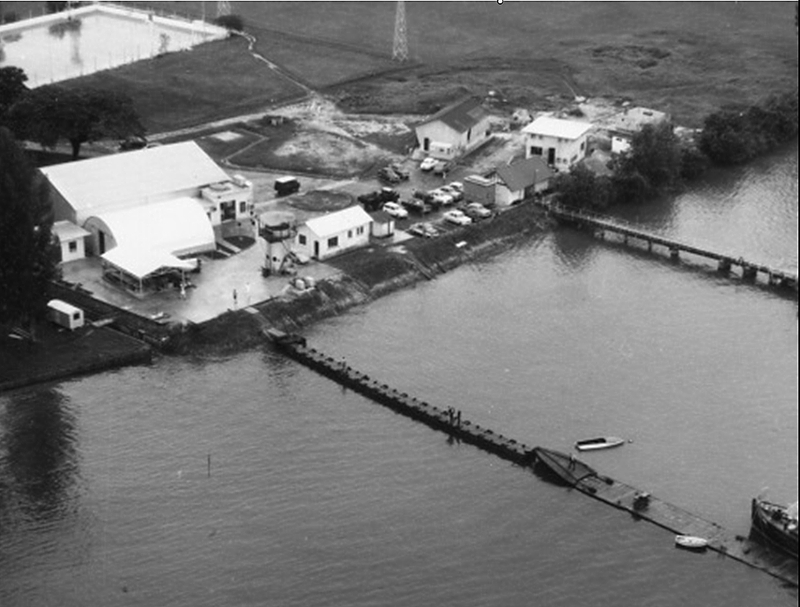 The largest clearance of ammunition took place in 1962 when the team was tasked to clear another WWII dump in the West Johore Strait. A mixed bag of British, American and Japanese ordnance was scattered over a large area. 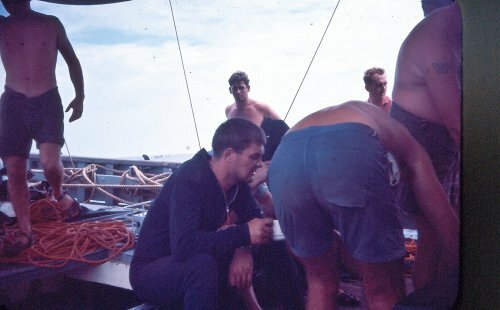 After an initial series of circular searches in depths from 30 to 80 feet, ammunition was brought to the surface by hand and placed underwater out of the sun in Carley rafts to keep it out of the tropical sun. From there it was transferred to an ammunition lighter and placed in canvas baths where it awaited weekly collection. This was a joint service operation with the Navy recovering the ammunition, the army dumping it in deep water out at sea and the RAF providing an excellent base for the operation from its yacht club nearby. 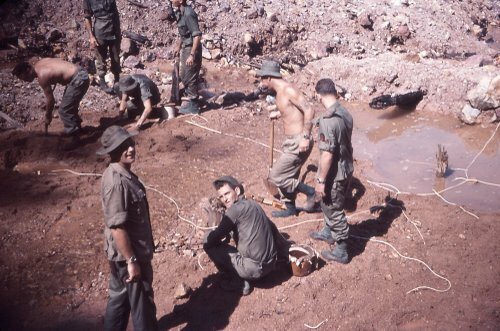 For the first three months about a thousand rounds per month were recovered using the Carley raft method but then the search moved into a more densely packed area where the ammunition was piled up in heaps and a more efficient means of lifting was required. Anchoring the MFV over the ammunition made the lifting easier but it still required a hoisting team. So dense became the piles of abandoned ammunition that the army provided a 'Z' lighter and a crane which increased the recovery rate to some thousand rounds per day. The job took seven months and 650 diving hours to complete. The ammunition examiners recorded 29,447 individual items of ammunition weighing some 400 tons, about 80 tons of which were lifted by hand. The ammunition itself was a mixed bag of British, Japanese and American ordnance in varying states of disintegration. The largest single items were Japanese 250 kg bombs which invariably spilled their cast picric filling all over the deck. In best condition were British 250 lb bombs and most numerous were British 25 lb HE shells. The most interesting items were the British 81mm mortar rounds, usually fused together in clumps of three or four, partially rotted with strikers exposed. The ammunition examiners declared them unarmed and safe because they hadn’t been fired. They were still handled very gently! Those items considered too dangerous were taken to a deserted beach in the vicinity and countermined. 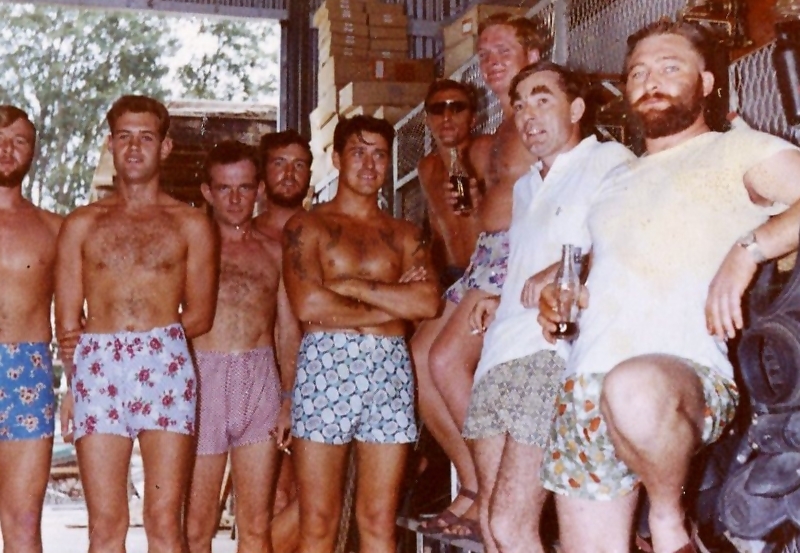 There were few hairy moments; it was mostly just hard graft. However, the Boss was called out over Easter as smoke was seen rising from one of the canvas baths in which the ammunition was stored underwater waiting disposal; some of the water had drained away leaving the rounds exposed. The situation was resolved by the swift addition of water. On another occasion, the Boss jumped a mile when the expansion of gas in a recovered 75mm shell case caused the shell to skitter across the deck right past him. That made everyone laugh. The team’s services also extended to the salvage of ships and the demolition of underwater hazards. 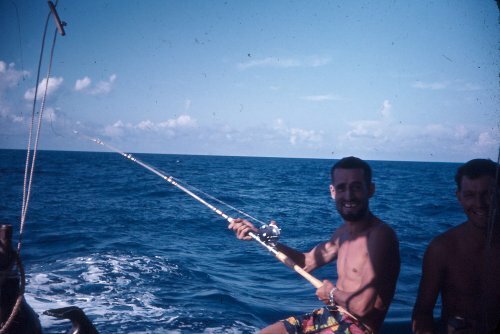 One of the more unusual jobs involved the recovery of over 100 tons of oil well equipment in 1963, seven miles off shore from Seria in Brunei. The equipment had been lost from a floating oil drilling rig during a gale. Six members of the team spent a month working around the clock to recover drilling equipment that included 7,000 feet of oil drilling pipe. PE had to be used to clear damaged sections of the 28” piping. 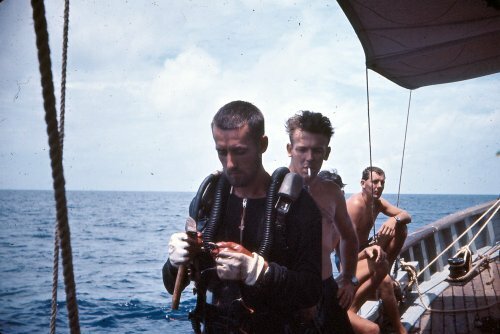 Divers were restricted to 40 minutes underwater once a day due to the depth at which they were working. 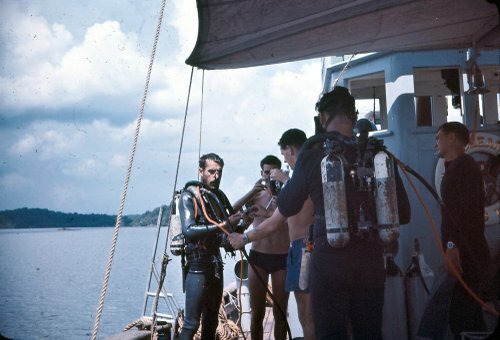 Throughout the sixties, the FECDT continued training divers; exercising the Fleet; performing underwater screw changes and other ship husbandry tasks; searching for items lost at sea; conducting salvage operations; and undertaking the never ending task of explosive ordnance disposal in the waters of South East Asia as far west as the Andaman and Nicobar Islands. The team even practiced arriving on task by parachute. The team also worked with similar groups from the Malaysian, United States and Australian navies. 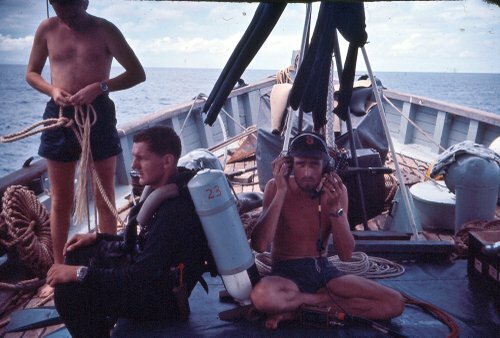 During 1965, FCDO David Burstall and the team had the privilege of carrying out a brief diving survey on HMS Repulse. Approval for this operation was granted on the grounds that it would be good training value as well as being of unusual interest. Although Repulse is not officially designated as a War Grave, it is regarded as such and stress was placed on the requirement that the ship was not to be entered and nothing was to be disturbed externally. This trust was faithfully observed. HM Ships Repulse and Prince of' Wales were sunk within an hour of each other by Japanese high level and torpedo bombers on 10 December 1941. The Repulse was the first to sink at 1233 as a result of five torpedo and one bomb hits. The Prince of Wales followed at 1320 having sustained five or six torpedo hits (two port side aft, followed by three or four forward, midships and starboard side aft) and one bomb hit. Both ships heeled over and capsized to port on sinking, with the Repulse proceeding at approximately 15 knots and the Prince of Wales reduced to less than 8 knots. The ships came to rest with the Repulse lying in a depth of 180 feet and the Prince of Wales eight miles to the east in a depth of 216 feet. HMS Repulse lies some 45 miles NNE of Pulau Tioman off the east coast of West Malaysia. HMAS Yarra laid a datum dan buoy some three days before diving operations were scheduled to begin and HMS Barfoil, acting as Diving Support Ship, with MFV 164 (Diving Team embarked) in attendance, laid an accurate heavy marker alongside Repulse. Diving conditions, generally, were excellent. The water was very clear and underwater visibility was so good that the silvery shape of Repulse could be seen from the surface of the sea through a face-mask, before the sun rose too high and veiled her with the increased reflection from the mass of particles in the water. Those that claim to have seen Repulse from the air and to have clearly seen her mast are mistaken. In fact, they have seen the shadow area cast by the bulge keel for this majestic and awe-inspiring ship lies on the sea-bed almost completely capsized to port with her starboard bilge keel uppermost and her decks under-hanging the horizontal by about 30 degrees. She lies in a mean depth of 180 feet with the stern in slightly deeper water of 196 feet, perhaps caused by a tidal scour created over the years by prevailing ocean currents. The bows lie on a heading of 196 degrees (true). The hull was in very good condition with remarkably little marine growth other than a scattering of sea eggs, a few anemones and small clams about eight inches across. On the wooden decks, which are bleached white and have lost their caulking, hang a mass of oysters. Fish life abounds and the first customers normally seen on the way down were large shoals of barracuda, static and staring with those big beady eyes. Highly coloured angel fish and parrot fish were always present around the wreck and, occasionally, larger and more fearsome inhabitants in the form of big groupers over six feet long which were given a wide berth by the divers. The only sign of action damage was a large jagged hole some 20 feel aft of and slightly above the starboard bilge keel from which twisted pipes and machinery protruded. The theory put forward that the 15 inch turrets fell out when the ship capsized is certainly not so in the case of `Y' turret, which was seen to be properly in place and trained aft. 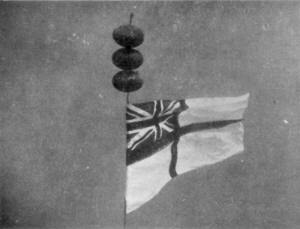 Had Repulse been upright and her mast intact, it was the team’s intention to replace her battle ensign prior to leaving the area. 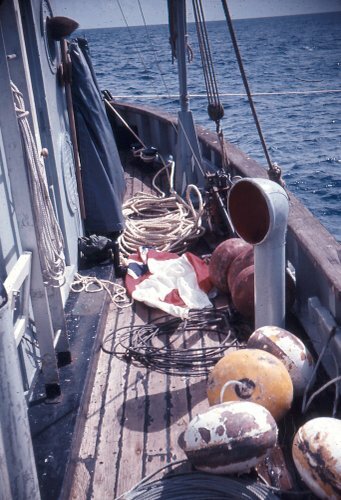 As this was not possible, a mast was made up of a 60 foot span of dan wire supported by three elliptical floats. This was `keel hauled' into position and secured to its own part around a propeller shaft. From this ‘mast' and immediately below was sewn a six breadths White Ensign which was last seen proudly billowing out in the tide. 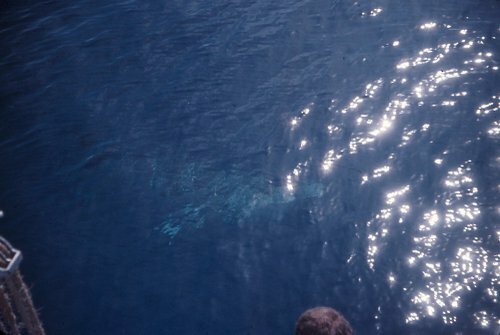 In 1966, FCDO David Lermitte and the team returned to the area and carried out a similar survey of HMS Prince of Wales, having first fixed her position by sonar. The team was backed up by Clearance Divers from HMS Sheraton and the Royal Australian Navy's CDT 1 with HMS Barfoil once again acting in support. A total of 64 dives were carried out between 160 and 180 feet involving an overall underwater time of 33 hours. 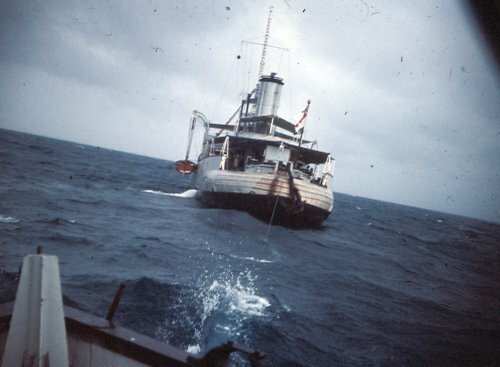 The weather was fine but the ocean current, although not strong, was unpredictable and at times hindered the operation by making the positioning of the diving support ship above the wreck difficult. The Prince of Wales was lying on a heading of 020° completely capsized. The shallowest part of the ship is in the vicinity of her starboard bilge keel at a depth of 150 feet. It was only possible, in the limited time available, to dive on three separate zones, amidships in the vicinity of the engine room, right forward on the stem and the right aft in the vicinity of the propellers and rudders. There was a large jagged hole about 20 feet in diameter in the forepeak, passing right through the ship, and in one place fracturing the stem post. The starboard outer shaft crossed over the starboard inner and its propeller was wedged between the inner shaft and the hull. There was a jagged hole some six feet in diameter slightly forward of where the two shafts cross over. The port outer propeller was missing and the bare shaft had been pulled away from the ship snapping the A-bracket in the process. There was a large hole about 12 feet in diameter a few feet forward of the A-bracket stub with the shipside plating jaggedly bent inwards. 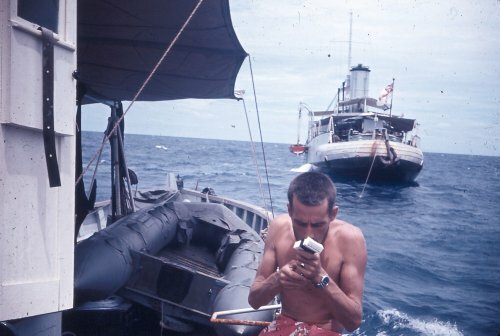 Diving conditions were generally good with, at best, a maximum horizontal visibility of 40 feet on the wreck, reduced to some 15 feet when the ocean currents stirred up the silt. The wreck abounded with marine life. 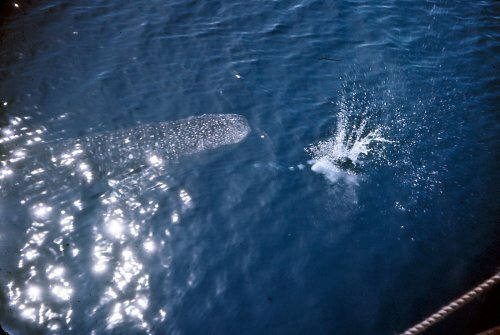 Apart from one very large and lethargic whale shark, no other kinds of shark were seen but large shoals of barracuda were frequently in attendance and, on a few occasions, a large grouper. Ex-CD1 Leo Whelan has kindly provided these photos of the Far East CD Team in 1963-5. 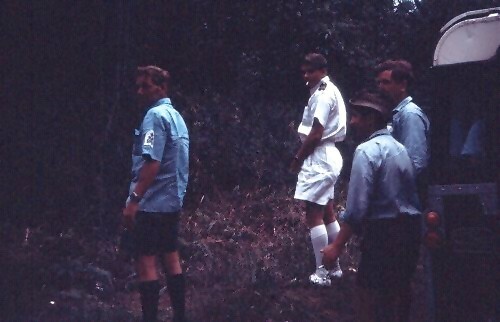 It includes pictures of the first diving inspection of the wreck of HMS Repulse in 1965 and the placing of a white ensign on it (see full story here). 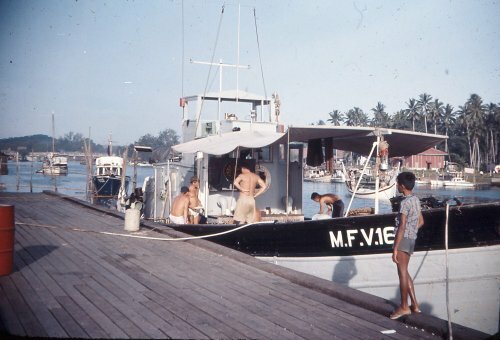 MFV 164 alongside at Mersing in Malaya. 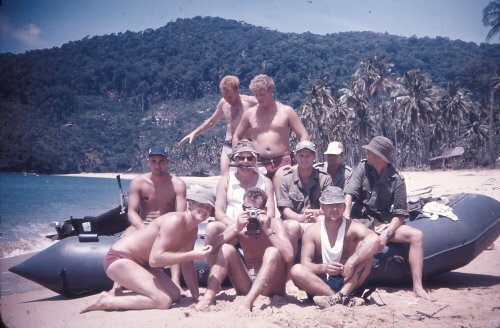 Another unusual task in which the team was involved concerned RFA Ennerdale, which sank on 1st June 1970 in 100 feet of water off the Seychelles while carrying 42,000 tons of fuel oils. To prevent the oil coming ashore, it was decided that immediate action should be taken to release the oil so that the South East Monsoon would carry the oil clear of the main islands. 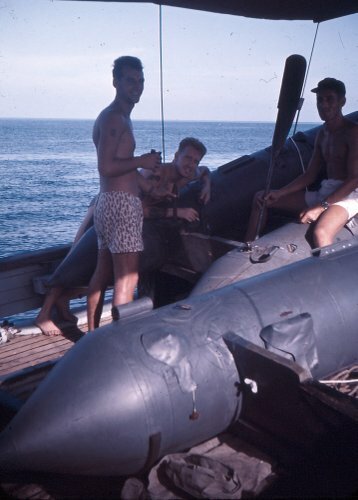 Conventional methods of placing explosives alongside the hull, using boats and divers, were impractical in the heavy swell so a method was devised whereby three mortar bombs placed on a pallet would be lowered into position on the wreck from a helicopter, the cordtex fuse then being ignited by the crew inside the helicopter. With Ennerdale lying on her starboard side, and using a Wessex helicopter, this method successfully breached the port tanks, releasing about 12,000 tons of oil. To reach the starboard side tanks another demolition charge was constructed. To place the charge in the correct position divers secured a 45 foot wire pennant to the top of the wreck and, using a gemini dinghy, joined it to a similar wire lowered from the helicopter. 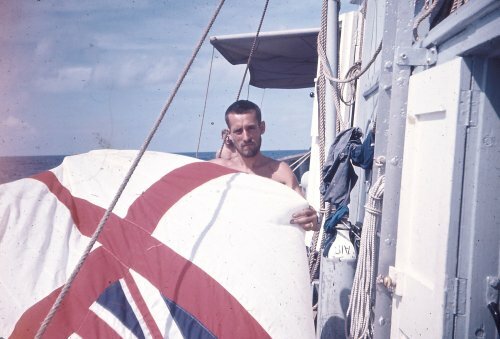 The dinghy raced clear, the helicopter crew lit the cordtex fuse and released the bomb tray which, on its ninety foot pennant, sank down alongside the vents on the lower tanks. Later in the operation, after the submarine HMS Cachalot was unable to fire torpedoes into the wreckage to free oil trapped in the hull, the warheads were taken off and sunk alongside the hull. When some of the warheads failed to explode, FCDO Brian Braidwood dived to investigate the reason. 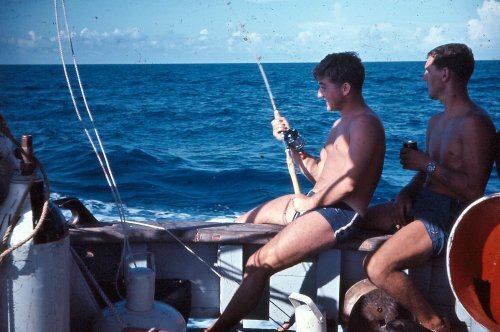 He added some short pre-cut delay fuses and ignited them while suspended above the wreck from the helicopter on the winch wire. There was always a swell, often heavy, and diving was dangerous. For showing remarkable ingenuity and courage in a difficult and dangerous situation, Lt Cdr Braidwood was awarded a Queen’s Commendation for Brave Conduct. 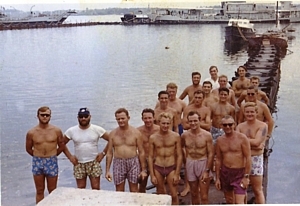 Following the government's directive in 1971 to withdraw forces from east of Suez, the Far East Fleet Clearance Diving Team was replaced by a small group of local divers to form the Singapore Armed Forces Diving Centre and look after the naval assets then belonging to the Maritime Command. 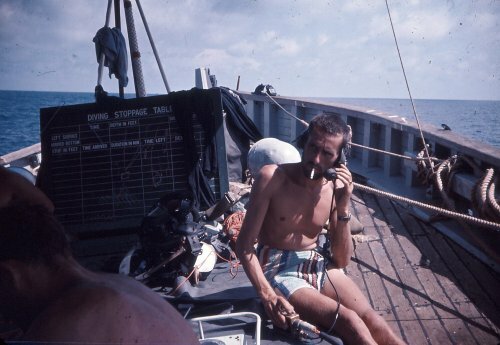 During their time in the Far East, the Fleet Clearance Diving and B&MD teams carried our many difficult, dangerous, unpleasant and sometimes boring operations in addition to those mentioned. These included searching for bodies as well as the many items, large and small that had been lost overboard. 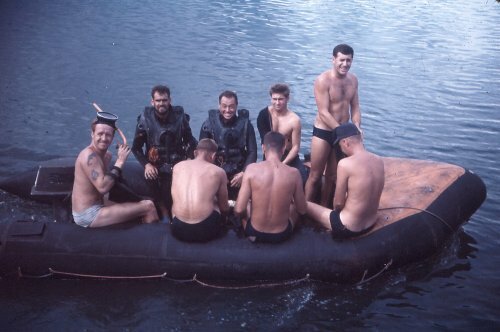 Over the twenty years of the team’s existence, upwards of a hundred clearance divers served in it. All conducted themselves in the best traditions of the CD branch with great professionalism and mostly to their own satisfaction. They stuck to the strict principle of never turning down a job even though it meant carrying out yet another fruitless search - just under that wave! 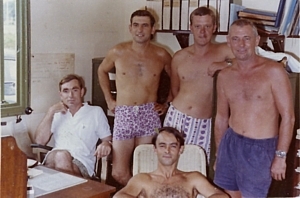 They operated in many different countries, from Kenya in the West to Fifi in the East; from Korea in the North to Australia in the South; in India, Iran, the Maldives, Mauritius and the Seychelles. The following includes just some of the team bosses and members listed according to their duties, without rank or rating (promotions often occurred in post), with the first names by which they were known, an initial or surname only. Team members are listed in alphabetical order. Hopefully, the list will be corrected and added to by those who were there. 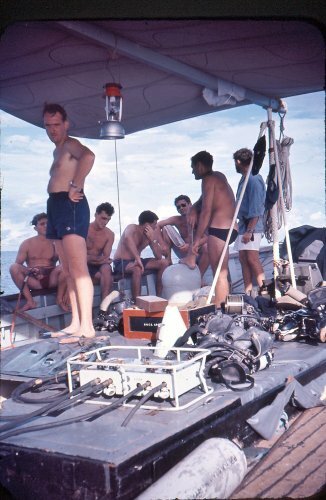 Also see The Far East Clearance Diving Team in which MCDOA member Brian Braidwood provides an illustrated account of his time in command of the Far East Fleet Clearance Diving Team during the late 1960s.